Countless Champions with titles such as GV (Grand Victor/Victrix), NS (National Select) and ROM (Register of Merit), as awared under the breed's founder. In addition, our Shiloh Shepherds are actively proving their temperaments and trainability. The ISSDC honors all for their efforts to improve the breed's future. Our Shilohs have earned numerous credits, and we are very proud to be the favored club of the most titled Shiloh in history (Nyssa), and the highest titled Obedience Shiloh on record (Baron). Plus many more! The list of acheivements is growing all the time! Are you interested in a professional club without all the damaging politics and the embarrassing disriminatory tactics? Breeders, haven't you been wishing for a club that you can be proud to refer your puppy people to? Here's your chance! 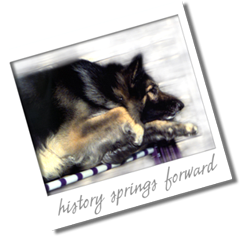 Researching the Shiloh breed? We are here to answer your questions so please join our eGroup on Yahoo! We welcome Shiloh enthusiasts from ALL registries at the ISSDC, the preferred club choice of many longstanding supporters! Join us today - we'll help you to realize your Shiloh's full potential and be all you can be!